It’s a return to the legendary ROCK FEST in Cadott WI for Lou Brutus! He’s been invited to once again host the main stage, July 16th thru the 19th. 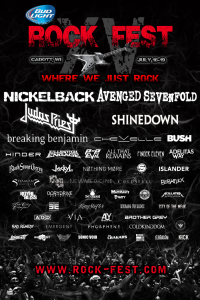 The lineup this year includes Avenged Sevenfold, Shinedown, Judas Priest, Chevelle, Breaking Benjamin, Bush, Hinder, Killswitch Engage, Pop Evil, All That Remains, Finger Eleven, Adelitas Way, Black Stone Cherry, Jackyl, Nothing More, Starset, Islander, Nickelback Shamans Harvest, New Medicine, Coldspell, Bobaflex, Royal Bliss, Otherwise and many others. Over 50 bands in all! Tickets are going fast and are available at Rock-Fest.com.